Conceptual Models Diagram from Norman, D. A. (1988). The Design of Everyday Things. New York, Basic Books. In his book, The Design of Everyday Things, Donald Norman explores methods to design usable objects and systems using everyday objects such as door handles and faucet knobs as examples. Norman emphasizes the role of conceptual models in creating easy to use systems. Any system or device will be easier to use if the user has a good conceptual model of how the system works. It is the designer’s job to create a conceptual model for the system that aligns with users’ mental models or educates users on the model of the system (p.189). Three different aspects of mental models must be distinguished: the design model, the user’s model, and the system image. The design model is the conceptualization that the designer has in mind. 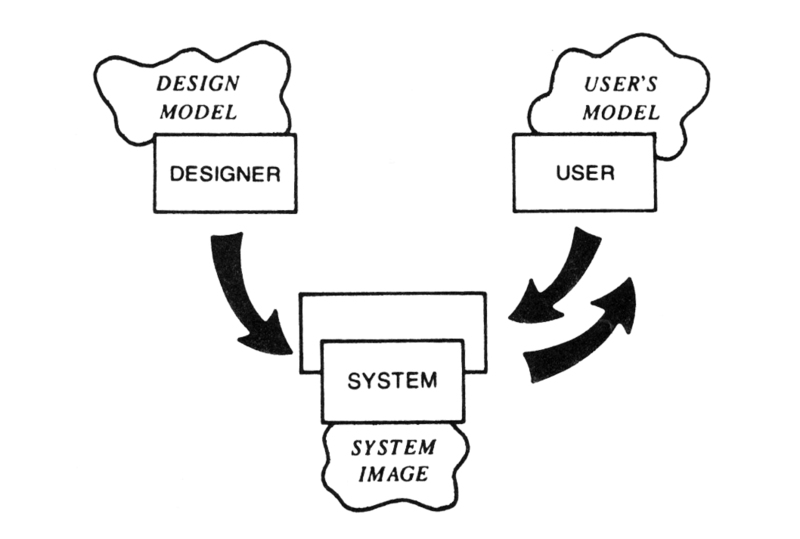 The user’s model is what the user develops to explain the operation of the system. Ideally, the user’s model and the design model are equivalent. However, the user and the designer communicate only through the system itself: its physical appearance, its operation, the way it responds, and the manuals and instructions that accompany it. Thus the system image is critical: the designer must ensure that everything about the product is consistent with and exemplifies the operation of the proper conceptual model (pp. 189-190). In complex systems aligning these mental models can be challenging. Designers are likely to be experts in how the system works, whereas users may have a limited or incorrect understanding of the complex system. This can create a situation where designers create a system that reflects their expert understanding, not the novice mental model of the user. This type of design error can commonly be seen in websites in which the navigation of the site is based on the org. chart of the business—a system image based on insider view of the business rather than a system image based how website visitors think about the organization or how they frame the tasks they want to accomplish. In higher education, programs, curricula, and courses are just a few of the many complex systems that leaders are called to design. University leaders have an insider expert conceptual models of the educational system—a model that is likely very different from the conceptual model held by students and other constituents of the university. Through user-centered design practices such as those recommended by Norman, educational leaders can design learning systems that are understandable and user friendly for their students. Norman, D. A. (1988). The Design of Everyday Things. New York, Basic Books.